A bomb exploded inside a car outside the courthouse in Londonderry. The explosion occurred at Bishop Street at about 20:15 GMT on Saturday, shortly after you received a warning. Officers were on the scene when the blast occurred. No one is believed to have been injured. Police had just started evacuating nearby buildings, including a hotel, when the explosion took place. Local politicians have told the BBC that the vehicle was hijacked in Derry some time before the explosion. "A cordon has been posted around the scene and police are evacuating more buildings on Bishop Street." In a statement issued on Facebook, the PSNI said: "As far as they know no one [is] injured. " However, they are" happy with "and they are evacuating the area and advising residents in the area to make arrangements for leave. Local resident Greg McLaughlin said: "It was very, very loud." I knew this was a bomb, "he said.
" We knew it was quite close. At the scene, BBC reporter. " Businesses and other properties have been evacuated and the cordon on Bishop Street has been extended. One business owner said she heard a bang and was at the time. Bishop Street is within Derry's famous city walls. Colin Neill, chief executive of Hospitality Ulster , said the explosion had caused major disruption in the Bishop Street area of ​​the city. "The. has to be condemned in its strongest terms, taking place on a Saturday evening when many people are out enjoying themselves." The Northern Ireland secretary, Karen Bradley, said she was "concerned with the reports coming from Londonderry and was". Sinn Féin MP Elisha McCallion said the incident had "shocked the local community." 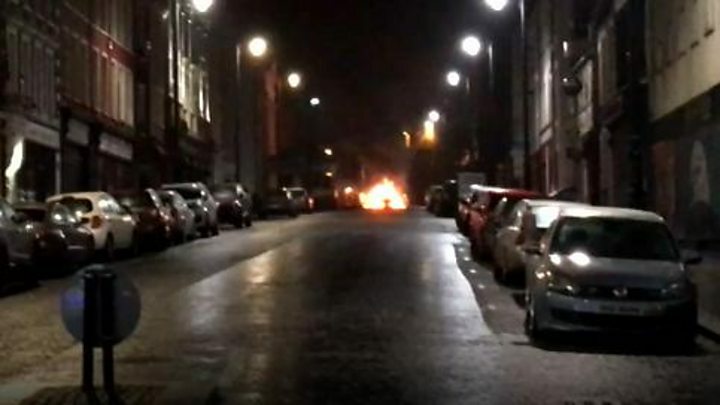 9659008] SDLP MLA Mark H Durkan tweeted: "Whoever is responsible for this explosion outside Bishop Street Courthouse in Derry has clearly not got the message that the people of Derry DO NOT want this on our streets." The DUP MLA, Gary Middleton, described the incident as a "disgraceful act of terrorism". His party leader Arlene Foster tweeted: "This pointless act of terror must be condemned." The Irish tánaiste (deputy prime minister) Simon Coveney condemned the attack. "There is no place and no justification possible Northern Ireland back to violence and conflict, "he wrote on Twitter. Did you witness what happened? haveyoursay @ bbc .co.uk .